Hector Riddell won the 37th bothy ballads celebration at Elgin Town Hall. A north-east performer has cemented his position as a bothy ballads stalwart by becoming only the second person to claim the “champion of champions” title for the sixth time. 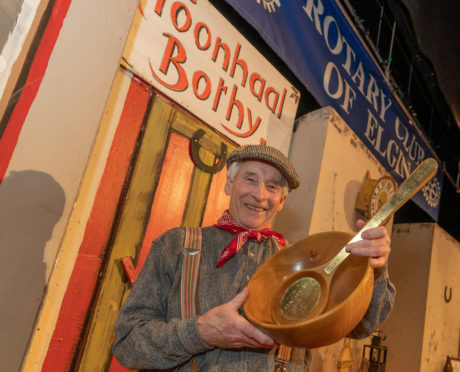 Hector Riddell won back the coveted porridge bowl and spurtle trophy in front of a packed audience in Elgin at the weekend. The 37th running of the celebration of traditional Doric farming songs brings together winners of six regional events and last year’s defending champion, who was Joe Aitken. Agricultural workers developed the tunes generations ago in order to keep themselves entertained while they grafted in the fields. Competitions are held throughout the year in Aberdeen, Kirriemuir, Turriff, Falkland, Keith and Strichen before the Elgin climax to keep the unique part of the north’s rich farming heritage alive. Yesterday, organisers described Saturday’s competition as one of the most memorable yet. Mr Riddell, from Finzean, Aberdeenshire, was named the winner of the title, which he most recently won in 2017 and 2015, following his soulful rendition of The Dying Ploughboy – which tells the story of a farm working saying goodbye to his horses and tools as he lies on his deathbed after sustaining a burst blood vessel. Volunteers decorated the Elgin Town Hall stage as a farming cottage christened the “Toonhaal Bothy” for the event, which was judged by agricultural consultant Morven Sivewright, who is also known for performing Doric songs and verse, and North East MSP and farmer Peter Chapman. Yesterday, George Duthie, president of organisers Elgin Rotary Club, said the event continue to prove a considerable draw for audiences across the north of Scotland. He said: “We had good folk come from near and far to enjoy, what I think was, the best bothy ballad night in the Elgin Town Hall that I have ever attended. “The five balladeers gave great performances and they were most ably supported by Gemma Donald and Alan Small on fiddle and accordion and by Pat Fraser reciting poems.